Join us for the first ever Shake & Make! Tour MODA’s latest exhibition Making Change: The Art and Craft of Activism and get creative! Light bites and libations are included with your ticket. Craftivism is a worldwide movement that operates at the intersection of craft and activism. Across the globe, artists, designers, and crafters armed with traditional materials like yarn, glue guns, quilt patterns, sewing needles, X-ACTO knives, and other tools are using their hands to protest social and political inequalities and injustices. The first Shake & Make will be held on August 7th at MODA and it will follow the Craftivist theme: "Social Justice Sewing Academy". Participants get to enjoy finger food, libations, a guided 45-minute tour, and get to meet and craft with fellow creatives! Crafting activities will follow the guided tour. Attendance is limited. Please sign up to secure your spot! If you have any questions about this event, please contact Dio Jensen at secretary@atlanta.aiga.org. 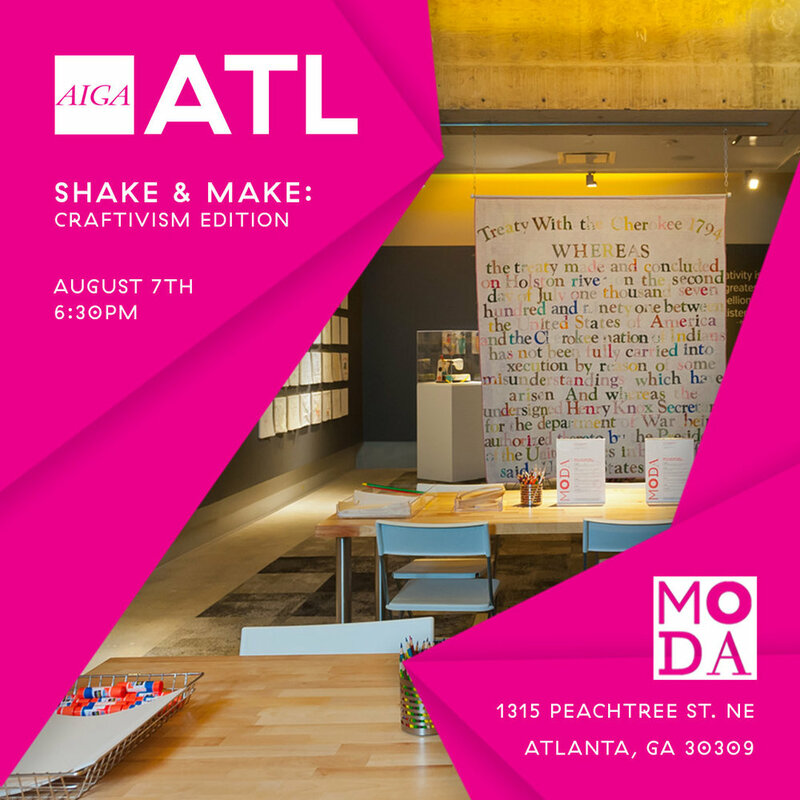 Shake & Make is a new exciting AIGA event in partnership with MODA. It is a casual creative series and social gathering, held every trimester at MODA influenced by the current exhibition’s theme. Our goal is to create a casual setting for creatives to connect, collaborate, and get inspired. 7:15 – 8:30: Eat, drink, craft and socialize!